Long before we had pots and pans, men and women knelt over fires and used what nature provided to put food on their table (or on the large rock serving as their table that evening). Today, we have knives, pots, spoons, and even large appliances like food processors. But that doesn’t mean you won’t ever need to know how to cook without them. 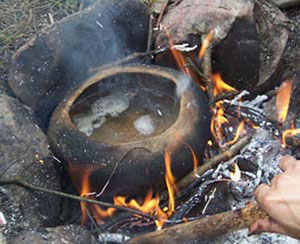 Whether you’re camping or in an actual emergency situation, there are 7 common primitive cooking methods that you still would better know even today. This is pretty similar to what we call tin-foil cooking. The difference is that you’ll use leaves instead of aluminium foil. First you need to make a fire slowly let it die while flattening the surface with coals of a fire. The coals should be hot but no longer burning (with flames). While the coals are getting hot, find some very large leaves that you can use to cook the food in. Remember that the leaves need to be large enough so that they can be wrapped around the food, but they also have to be non-poisonous so that you don’t ingest toxins. Bonus points if you find leaves that are also edible. Also, try to find leaves or plants that have vines attached to them. These work well for wrapping around the food and turning it into a little bundle. 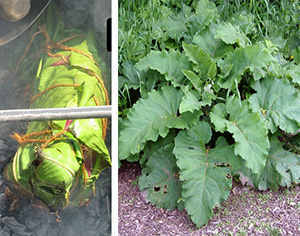 A very common and very good example are burdock leaves (see picture above). These leaves are really big and they’ll produce a delicious juicy meal. Once the food is wrapped and the coals are hot, place the food onto the coals. Using a stick, move some of the hot coals over top of the food so that it can cook on both sides. Broiling over a fire isn’t that much different than broiling in your oven. The only difference is that, over a fire, you might not have a pan to lay the food in, so you’ll need to set something up that can hold the food over the fire without it falling in. River birch and willow are great woods you can use for broiling over an open fire because they are flexible, and flexibility is key when trying to find the right kind of wood for this type of cooking. You might also need a couple of pieces of the same type of wood; the more you have, the more effective your cooking device will be. Start constructing your “broiler” by bending one piece of wood into an oval, and crossing the bottom of the oval with another straight stick (think of an upper case D). Use small twigs or vine to tie the oval-shaped wood onto the straight stick, but you can stretch the top piece so that it reaches down the entire straight piece of wood. Then, if you wish to make the wood even more stable, add smaller pieces of wood across the two pieces of wood. This will give support to the food and if you’re handy enough, will also allow you to move the wood up and down to fit specific pieces of food. Once you have your “broiler” set up, you just need to attach the food to it. 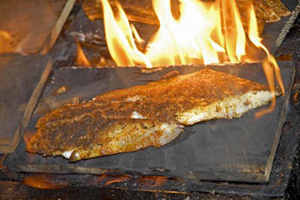 When cooking fish, you can do this just by piercing the skin onto some of the wood, and for larger pieces, you can simply lay it across. Then just hold the broiler several inches from the flame to keep it from burning, and keep it flat to keep your food from falling in. Cooking on a hot stone is really no different than cooking in a frying pan. 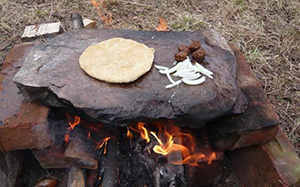 Using a flat surface such as a rock, you just have to heat it up, place your food on, and then heat it up a little more. Be sure that the rock is dry, so it will heat up faster, and that it has at least one flat side so your food doesn’t fall off. Give it a quick clean by dusting it off with a cloth and make sure it’s thicker than one inch, so that it doesn’t crack when heated to extreme temperatures. You can cook with stone one of two ways. You can either use a small stone for a single serving, or you can place many stones over a low and wide fire, using them to cook larger quantities or larger pieces of food. For a larger area you’ll need to let the stones heat up for at least an hour, whereas you can probably get away with fifteen minutes or so for just a single stone. Once the stone is hot, place your food on it and just wait for it to cook through – the time it will take will depend on what you’re cooking and your own taste preferences. Remember to remove the stone entirely once the food has finished cooking and to keep the food on it, using it as a platter or plate. The stone will take at least half an hour to cool down, so it will keep your food nice and hot for you. Unless you can find a smooth, even piece of wood in the forest (which is likely to prove difficult), you’ll need an axe or a saw to create planks suitable for cooking. First, know the type of wood you’re looking for. Don’t use anything poisonous, and don’t use wood such as conifers, which can have a strong tasting resin that can seep into your food. Some of the best woods for making planks are poplar, cedar, and oak. Find a piece of wood that you think would make a nice plank. If you find a small log, cut it in half and then, placing it on its flattest side, cut planks from it about nine inches in diameter. You can also use two planks at once, letting one hold the food while the other holds the other up, away from the fire and from getting burned. Some people choose to place pegs onto their board, wedging them into holes cut with a knife. However, this extra step isn’t necessary, as you can just leave the board lying flat and the food should remain in place. 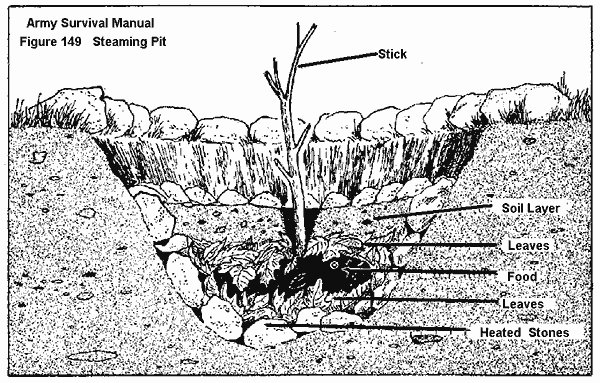 Steam pit cooking is a form of survival cooking that has been used for centuries. 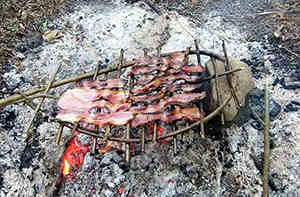 You must start by wrapping the food in large leaves, just as you do when ash cooking, and then you need a place where you can build a pit large enough to hold coals and the food. When digging the pit, make sure you dig it at least a foot to two feet deep. This will be large enough to not only hold the food, but also make sure no steam escapes while cooking. Once the pit has been dug, line the bottom of it with charcoal. Light the coal, again just like you did when ash cooking, and wait for it to get very hot and then die down. Then, place your food over top of the coals and then cover it with the earth you dug up. Allow it to sit for at least a couple of hours (even small food will take a while to cook this way), and then dig it up, and dig in! If you’ve ever checked out a whole chicken spinning slowly on a rotisserie, you’ve already seen spit cooking firsthand. There are both horizontal and vertical spits and if you want the metal rods equipped with teeth that help hold the meat, you’ll likely have to already be carrying this as you won’t find anything like it in nature. But, you can create your own spit just by finding a strong, long, and sturdy piece of wood. While tying a piece of meat onto a piece of wood and turning it over an open fire sounds easy, spit cooking does come with its own unique set of issues. To begin with, any meat that can be tied to the spit must be tied to the spit. This will keep the meat sturdy on the spit and will keep it from bouncing around. Also, it’s important to remember that meat shrinks when it cooks, so even if you think you’ve tied the meat closely to the spit, it still might not be close enough. Use wire, vines, or twine to really secure the meat onto the spit. 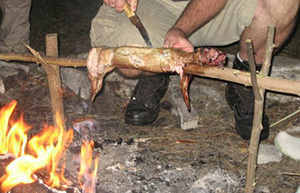 If you’re roasting a whole animal, also be sure to tie up the limbs. If you don’t the center of gravity will be thrown off and the meat will once again bounce around the spit instead of clinging to it. Remember too that if you don’t turn the spit, you’re broiling, not spit cooking. Out in the wilderness, and especially in survival situations, you likely won’t have a spit that automatically turns for you, so you’ll have to sit by the fire and manually rotate it yourself. Some think that our earliest ancestors cooked in clay, but that’s just not the case. By the time clay tools were introduced, humans had already been cooking for generations. But you don’t need to carry around a clay pot that’s prone to breaking while backpacking – dig far enough and you’ll find it. Just make sure that the area you dig for the clay wasn’t once the place of toxic chemicals – such as being the former site of a gas station. Once you’ve found your clay, you can add a bit of water to mold it into shapes such as bowls and pots, although these will take hours to dry. You can also simply pat the clay onto and around the wrapped piece of food. Be sure when doing it this way that the clay is in an even layer, to promote even cooking. Then, just simply lay the clay-covered package over hot coals and allow it to cook. The time of cooking will depend on not only the size of the food being cooked, but also the thickness of the clay. Serving food that’s been cooked in clay is one of the most exciting parts of clay cooking. Because the heat will harden the clay around the food, use a small hammer or rock to break open the clay. It will crack and fall apart, and make meal time that much more enticing.